Grubhub completing Eat24 acquisition as Bite Squad gobbled up local delivery services top the headlines on this edition of MRM’s Daily Bite. Send news items to Barbara Castiglia at bcastiglia@modernrestaurantmanagement.com. Grubhub Inc. closed its acquisition of Eat24 from Yelp. Yelp previously announced its plan to sell Eat24 as part of a strategic partnership with Grubhub to integrate online ordering from all Grubhub restaurants onto the Yelp local goods and services platform. The partnership with Grubhub became effective upon the closing of the sale, and is expected to increase the number of order-enabled restaurants on Yelp to approximately 75,000 when fully implemented. Bite Squad, an online and mobile food ordering and delivery service, completed the acquisition and integration of 17 local restaurant delivery companies as part of its strategy to consolidate the fragmented restaurant delivery service industry and expand the company’s national footprint to more than 30 metropolitan areas across the United States. Founded in the summer of 2012 in Minneapolis, Bite Squad has partnered with local restaurants across more than 30 metropolitan areas, hand-picked a best-in-class customer support squad, and assembled a fleet of environmentally friendly vehicles to deliver fresh food from the restaurant straight to your door, quickly and hassle-free. 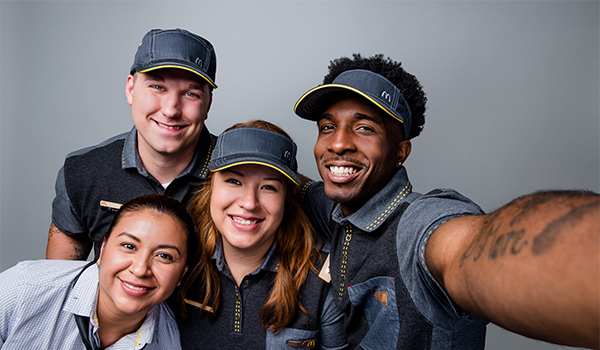 McDonald’s modern approach to recruiting – Snaplications – is back. For Millennial job seekers, this is good news since according to a recent survey conducted by Wakefield Research on behalf of McDonald’s, 67 percent of Millennials will look for a seasonal job. Knowing more than half of hires at company-owned restaurants are under 24 years old, McDonald’s utilizes Snapchat as a recruitment tool to meet potential job seekers where they are – their phones. ‘Snaplications,’ a term coined by McDonald’s, is a first-to-market hiring tool in the U.S. that allows job seekers to be served an ad and opportunity to begin the application process for a job at a McDonald’s restaurant through the Snapchat app. Snaplications run through November 28. While only three percent of U.S. recruiters are using Snapchat, McDonald’s approach with Snapchat paid off during the summer hiring period. The company saw a 35 percent increase in application flow and a 30 percent traffic increase to the careers page due to the combined efforts of Snaplications and the larger marketing campaign. While many will use extra money from a seasonal job to buy someone a gift or treat themselves, others are looking to learn new skills they can take with them to another job, according to the McDonald’s survey – such as people skills (37 percent), patience and customer service (31 percent), time management (23 percent) and quick math (10 percent). “These transferable skills are a staple at McDonald’s restaurants and set people up for success, whether they stay with the brand or further their careers elsewhere,” Marcos added. McDonald’s and its independent franchisees strive to offer a work environment that sets people up for success at their McDonald’s and beyond …with education programs such as Archways to Opportunity®, which gives eligible employees in participating restaurants an opportunity to earn a high school diploma, receive upfront tuition assistance for college courses, access academic advising courses, and learn English as a second language. Russo’s Restaurants, which includes Russo’s New York Pizzeria as well as Russo’s Coal-Fired Italian Kitchen, recently appointed award-winning Vincenzo “Enzo” Lavecchia, top photo, as corporate chef, where he will lead menu expansion, staff development and more. The new corporate chef will spend time at every Russo’s Restaurants location training managers on proper food preparation and culinary techniques. A native of Italy, Lavecchia will ensure each Italian-inspired dish is as authentic as possible by passing his skills and knowledge on to each location’s kitchen team. A two-time world champion pizza maker and a three-time United Arab Emirates pizza champion, Lavecchia is no stranger to the kitchen. His strong background in the culinary industry includes more than six years experience working as a head chef at Eataly and Ronda Locatelli in Dubai. Lavecchia piqued his culinary interest at a young age at home in Italy, where he grew up learning how to create a wide variety of Italian dishes. While attending Armando Perotti catering school, he learned the importance of adding a signature twist to dishes without compromising authenticity. Russo’s Restaurants is a 47-location national and international franchisor of the fast casual and casual dining brands Russo’s New York Pizzeria and Russo’s Coal-Fired Italian Kitchen. Based in Houston, Russo’s Restaurants is composed of a mix of corporate and franchised locations across Texas, Oklahoma, Arkansas, Tennessee, Florida and Hawaii. Russo’s has entered international markets as well, with locations in Dubai, Abu Dhabi and Sharjah, in the United Arab Emirates. There are an additional 30-plus units in development both in the United States and internationally. With Oct. 16 being World Food Day and restaurant prices rising, the personal-finance website WalletHub released its report on 2017’s Best Foodie Cities in America. To determine the best and cheapest local foodie scenes, WalletHub compared more than 180 of the largest U.S. cities across 24 key metrics. The data set ranges from affordability and accessibility of high-quality restaurants to food festivals per capita to craft breweries and wineries per capita. New York has the most gourmet specialty-food stores (per square root of population), 1.3907, which is 56.5 times more than in West Valley City, Utah, the city with the fewest at 0.0246. San Francisco has the most cooking schools (per square root of population), 0.0567, which is 37.8 times more than in Omaha, Nebraska, the city with the fewest at 0.0015. New York, has the most restaurants (per square root of population), 10.59, which is 37.8 times more than in Pearl City, Hawaii, the city with the fewest at 0.28. Orlando, Florida, has the most ice cream and frozen yogurt shops (per square root of population), 0.3158, which is 38.5 times more than in West Valley City, Utah, the city with the fewest at 0.0082.